Take a look around any college campus these days, and you’ll see a lot of stressed out students. It’s a competitive world out there, and they all want to give themselves the best opportunity they can to come out on top. A surprising amount of these students have resorted to using prescription ADD medications to help them make it there. ADD/ADHD drugs like Adderall, when taken by someone who doesn’t experience symptoms, provides an energetic, alert, positive feeling that can help you study, focus, research, and/or write well into the night. Of course, there’s a risk to taking prescription medications that aren’t prescribed to you. You may experience a negative reaction, it may interfere with other medications you’re taking. And that doesn’t even touch on the fact that buying and using someone else’s prescription drugs is expensive and against the law. Enhance Mind IQ is a nootropic supplement. Simply stated, its purpose is to mimic the effects of Adderall, making you sharper, quicker, more focused and alert, better able to fact the cognitive and creative challenges you face each day. In short, according to them it’s basically over the counter adderall, although of course they don’t explicitly state that. Let’s find out if it REALLY works as well as they say it does. If you take a look at the Enhance Mind IQ website, you’ll see they don’t hold back on the promises. Energy levels to the moon and beyond. Increase your memory and focus by firing up your brain’s neurotransmitters. Reduce stress and distractions so you can stay sharp and alert longer. Improve your memory and retention so you learn better and adapt and perform better at new skills. Increase overall brain health by improving blood flow, transporting oxygen and nutrients where they’re needed. You have to admit, if you found a supplement that could provide these kinds of results, you’d use it, right? In fact, this is not the first supplement I’ve come across that has made these same exact claims. Supplements like Cogniq and Synapsyl all basically label themselves as “Viagra for the brain”, which of course would imply that they will give your brain the boost it needs. But we’re more than a little skeptical of the ability of Enhance Mind IQ to come through on its promises. There are a few red flags right off the top, so let’s get into that for just a minute before moving on to the formula. 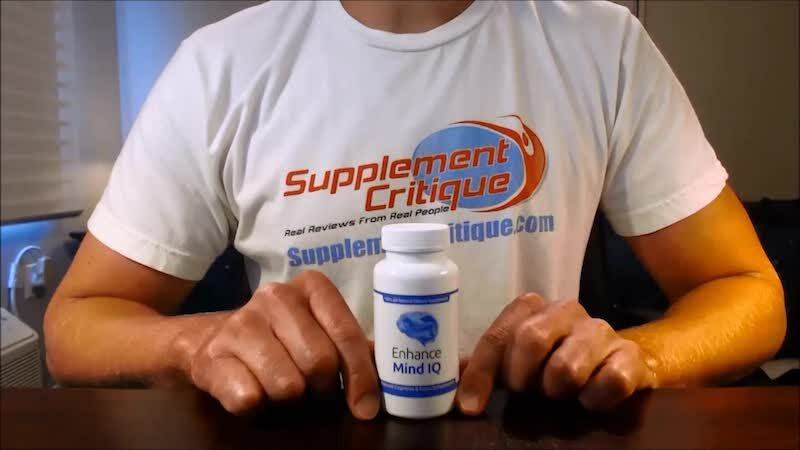 Enhance Mind IQ claims to have been featured by several media outlets, like The New York Times and CNN, but when we conducted a search for those features, we didn’t even come up with one mention of Enhance Mind IQ from any of the noted outlets. If you don’t believe me, click here, here, and here to see for yourself. Enhance Mind IQ makes these claims complete with percentages of improvements you can expect. But where do these numbers come from? And what do they even mean. What even is “brain power”? How is it measured? They make that claim but offer no link to or discussion of the clinical trial where that number came from. My readers ask me all the time how companies can get away with making specific claims like this one without getting in trouble, or at least made to remove the claim. I don’t have an answer other than to say these companies aren’t very well regulated. A company will make a false claim, and by the time enough people complain to get it noticed, they’ve moved on, changed their name, and are selling the same stuff with new and different packaging. When products are sold online, there is usually a bunch of customer feedback available online as well. This is not the case with Enhance Mind IQ. All we could find in terms of customer feedback were three brief yet glowing testimonials from some very attractive “users”. It’s not impossible that these are real people sharing their real results, but it’s pretty close. Taken separately, these are not all that bad. Companies will promote their products, and that can sometimes lead to exaggeration.But when you see three plus indications like these, you start to wonder. Red flags or no red flags, the most important thing to know is what goes into the formula. In the case of Enhance Mind IQ, they don’t provide a label or complete list, but they do provide a few highlights. There’s: Vinpocetine, Bacopa Monnieri, and Phosphatidylserine. Interestingly, Enhance Mind IQ claims there are two key ingredients, then goes on to list these three. Vinpocetine may increase the flow of blood to the brain, which is beneficial for increasing energy and improving overall function. It may also protect neurons against damage. Dosing for Vinpocetine isn’t uniform, but at this time, recommendations are to dose it pretty low at 10 mg or so. Bacopa Monnieri may reduce anxiety as well as improving memory. It’s mainly been tested in elderly patients with age related decline, but may have benefits to the young as well. Bacopa is also known as an adaptogen, meaning that it helps the body adjust and respond appropriately to stressful conditions and difficult situations. The recommended dose is at least 300 mg a day, and if in powder or extract form, 750-1000 mg per day. Phosphatidylserine is produced by the body in small amounts, but is mainly ingested with the foods we eat. Supplementing is also used to help treat increase amounts when necessary to treat certain conditions, including Alzheimer’s Disease, age-related cognitive decline, ADD/ADHD, and bodily stress brought on by physical exertion. It works mainly by protecting brain cellular health. There is no hard and fast rule on dosing with phospatidylserine, but the most commonly recommended dose is 100 mg taken 3 times a day when used to fight the symptoms of Alzheimer’s Disease. Each of the listed ingredients does have potential to boost brain function – the is true. Yet there remain several mysteries related to the unanswered questions of what other ingredients are used, and what are the potential side effects. While we have no answer for what other ingredients are used, we are aware of some of the stated ingredients and their history with side effects. Phosphatidylserine is thought to be relatively safe at levels of 300 mg a day or less, but the incidence of nausea and insomnia increase above that. It should also be noted that phosphatidylserine may have the potential to cause negative interactions with certain medications, including antihistamines as well as some Alzheimer’s Disease medications. It’s important that if you take any prescription medications that you discuss phosphatidylserine with your doctor before using it. Bacopa Monnieri is known to cause nausea and cramps. As we mentioned above, we were unable to find any independent customer reviews for Enhance Mind IQ. The only “feedback” available is what you can find on the website in the form of testimonials, and it’s always a good idea to take these with a grain of salt because they tend to be cherry-picked, embellished, or downright made up. After I originally wrote this review, a few legit testimonials seemed to pop up on the website Highya.com, which shows 2 people who mentioned using it. Each said virtually the same thing, that Enhance Mind IQ does NOT work. If you search for reviews on Youtube, as usual, you will find nothing but blatant advertisements for the product. These so called “reviews” of Enhance Mind IQ are so bad they’re basically laughable. They’re nothing more than blatant advertisements of the product. You won’t find Enhance Mind IQ in stores in at online retailers like Amazon.com, or even in stores like GNC, Walmart, Vitamin Shoppe, or CVS. It may become available on Amazon at some time in the future. Many such products do. You can order it outright, at the cost of $79 a bottle.The bottle will last a month, and they throw in a bonus bottle of Enhanzed ZZZ to help you get a restful night’s sleep so your mind is fresh and ready to go in the morning and throughout the next day. The product is covered by a money back guarantee. If you’re not satisfied with your purchase, you must call customer service at 1-866-482-8277 within 60 days to receive an RMA number. Once you return the product, you’ll be credited a refund. The customer is responsible for return shipping charges, but we didn’t see any mention of a restocking fee, so the refund should be for the full supplement price. The terms do not mention any bonus bottles and how they may affect the guarantee, so make sure you’re clear on that if you’re planning to return the product. The wording used in the Terms and Conditions document is that you must return “any/all remaining product” so that indicates that it is expected some will be used before you decide to return it. Or you can order Enhance Mind IQ by signing up for their free trial program. We talk about these scams all the time, and this one is no exception. You sign up by paying $4.95 for shipping, and they send you a “free” one month supply bottle.Most customers think this is the end of it, but they are incorrect. Unless you call their customer service number and cancel your subscription (a subscription that you probably didn’t even know you subscribed to), on the 14th day after you place your order, they’ll charge you $89.92 for that “free” bottle, and start sending you a new bottle at that same price each month until you do cancel.Funny thing is, the free trial costs more than buying a bottle outright. If you do find yourself in this predicament and you need to cancel, call their customer service number at 866-482-8177. The ingredients are claimed to be all natural. The formula lists three ingredients – Vincpocetine, Phosphatidylserine, and Bacopa Monnieri – each of which is capable of improving brain function on some level. You don’t have to use the free trial option to purchase Enhance Mind IQ. You can order it outright as well. They don’t list the entire formula or amounts even of the ingredients they do list. This means it’s really impossible to tell whether or not it will be effective. You can get caught up in an autobilling nightmare if you’re not careful when signing up for the free trial. There are no independent reviews from customers who’ve actually used it. While they claims quantifiable results, using specific percentages of improvement, they don’t cite actual studies where these quantifiables were proven. More and more supplement companies are coming out with nootropic formulas (so called “Limitless Pills”) now that the market for them has gotten so big. This is a good thing on the whole, but it has the potential to bring out some bad actors just looking to make a quick buck and move on. Without having tried it yet myself, it’s actually tough to tell where Enhance Mind IQ falls on the spectrum. On the one hand, they make unrealistic and unsubstantiated claims, but on the other hand, they list 3 solid ingredients in the formula. The truth is, however, even with good ingredients, they won’t do a thing for you unless they’re used in appropriate amounts, which we don’t know is the case. At this point, it’s unknown how effective Enhance Mind IQ might be. But the fact that they use a free trial scam is not a good sign. If you find yourself drawn to it, consider making a purchase outright, with knowledge of the 60 day guarantee in mind. It may turn out to be the best $80 you’ve ever spent, or it may be a waste of money.It’s good to know you can recoup most of it if that turns out to be the case. Have You Used Enhance Mind IQ? I tried the pay shipping only trial but they kept charging me more and it did not work. Avoid free trial. To me it's another scam as far as I'm concerned anyway. Enhance mind IQ barely did anything for me. 58 out of 63 people found this review helpful. This company is a bunch of crooks. I refused shipment and they will not refund my money. Also they included an order of Omega pills which I did not order. I,m filing a complaint with the Attorney General. The company is ripoffs. YOU WILL BE SORRY IF YOU DO ORDER THESE PILLS!!!!! The ingredients on the Enhance Mind IQ bottle do not include what was mentioned above. It does seem to help me very slightly but I'll give those results to the placebo effect. It's not worth the money. It's basically a $70.00 bottle of vitamin B12. 21 out of 25 people found this question helpful.